Maximize usable garage space so you know exactly where to park and when to stop. Perfect for two-car garages—up to two laser parking assists will work with each Garage Door Opener. 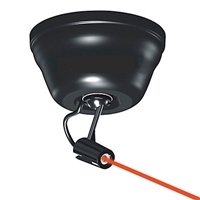 Features a Class 2 laser that is safe on the eyes, yet clearly visible. The LiftMaster® MyQ® Internet Gateway alone with the LiftMaster® Control Panel. (gateway sold separately) With it you can upgrade your LiftMaster® garage door opener manufactured since 1998 to the new MyQ® and Security+ 2.0 radio systems so you can control and manage your LiftMaster® garage door opener and other MyQ® accessories from anywhere in the world by using your smartphone, Alarm.com account and or 2GIG security panel. The LiftMaster® MyQ® Retrofit Package includes (1) MyQ® Control Panel and (1) LiftMaster® Internet Gateway. With it you can upgrade your LiftMaster® garage door opener manufactured since 1998 to the new MyQ® and Security+ 2.0 radio systems so you can control and manage your LiftMaster® garage door opener and get worldwide computer or smartphone access to your garage door opener. All you will need is a free port on your router to connect the 888LM so it can interface with your smart phone through your WiFi, Internet, alarm.com account and or 2GIG security panel. The LiftMaster® MyQ® Garage Universal Smartphone Garage Door Controller includes (1) Door Sensor and (1) Wi-Fi Hub. With it you can control up to two garage doors at once (requires extra door sensor, sold separately) and up to 16 MyQ-Enabled devices. The Wi-Fi Hub wirelessly communicates with the garage door opener over your home’s Wi-Fi. Alerts can be received as email or pop-up (push) notifications on your mobile device so you always know the status of your garage door and home lighting. 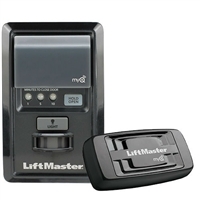 The LiftMaster MyQ Garage is compatible with most major garage door opener brands with Photo Eyes, including LiftMaster, Chamberlain, Craftsman, Linear, Genie, Overhead, Stanley, and Wayne-Dalton.